This paper, a collaboration with my academician wife, was published in The Malaysian Corporate Secretary Journal. Below is the conclusion of the paper.
" The overall price of an Islamic home financing includes upfront cost, total profit (BBA financing), total rental (MM financing) and incidental fee charges. The upfront cost are processing fee, disbursement fee, legal fee, stamp duty and MRTA and incidental fee charges are late payment penalty fee, capital prepayment fee and early settlement fee. While BBA profit and MM rental are conceptually different, the mechanism applied to compute the profit or rental is the same. Both BBA and MM financings make use of annuity concept and standard mathematical amortization model. 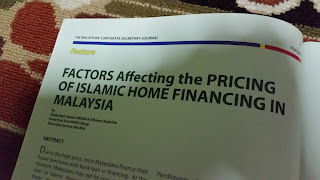 There are many factors affecting the total home financings such as amount of financing, tenor, rate(s), age of customer, banks’ policies on advance or early payment or extra payment, instalment amount, payment pattern, profit during construction, late payment fee, capital prepayment fee, early settlement fee, banks’ incentives and government incentives. "